The 2019 Champions Cup comes alive with the rich program of the heats just ended. All the drivers present started their first tussles of the year. As expected, the 60 Mini holds focus with the largest total number of drivers. The elimination program, started yesterday, ends with, as usual, Coskun Irfan in front of everyone. The British driver starts from where he'd left off with five successes in the five heats foreseen, valid for the pole position of Prefinal A. Behind him a good Alex Powell, author of three total successes and holder of the first grid spot for prefinal B. Behind them, Rashid Al Dhaheri, among the most consistent with five second places, and Lukas Malek, protagonist of a triumph. Tomorrow morning the pre-finals with the Prefinal A at 11.10 am and the Prefinal B at 11.30. Final of the category scheduled at 3.05 pm, preceded by final B at 12.30. In the absence of the KZ, the queen class of the event provides a great show to start from. 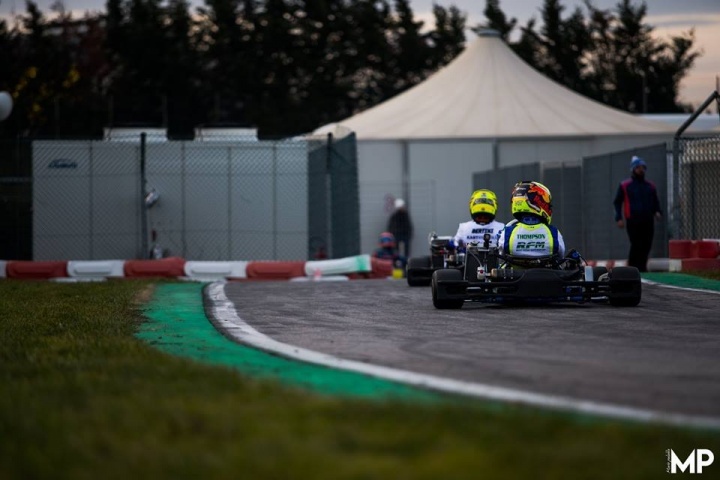 The Best Rookie of 2018, Harry Thompson, puts his hand on the final with the first grid position at the end of the three heats available. Dexter Patterson follows closely with the second position by only one point difference from his compatriot, third and the first of the Italians, Cristian Comanducci. Closing the first top five of the year are Dilano Van T Hoff and Aleksey Sizov. Out of the top five but ready to fight for tomorrow, hot names like Gabriele Minì and Lorenzo Travisanutto, respectively in ninth and twelfth position. Tomorrow's prefinal at 11.50, final scheduled at 14.05. Tight fight even in the Junior with the surprising James Wharton in front of everyone in the combined ranking. The pole man for the Prefinal A obtained four total victories over four heats available, behind him is Andrea Antonelli, able to impose himself in three out of four fights. Good results for Thomas Ten Brinke and Alex Dunne, respectively in second position for group A and B. Closing the top five overall Marcus Amand and Ariel Elkin, protagonists of fights at the top in all four direct matches. The two pre-finals will be staged at 10.30 (A) and 10.50 (B), the final scheduled at 2.35 pm, preceded also in this case by the final B, 12.10.